IVORYTON — The Rockfall Foundation presents the 2nd annual Night at the Ivoryton Playhouse on Thursday, Aug. 17, at 6 p.m. The 1970s brought us the Clean Water Act and the Clean Air Act and it’s also the decade that brought us disco! It’s been 40 years since the release of the film Saturday Night Fever – the inspiration for this electrifying musical – and the Foundation invites you to celebrate this milestone while supporting essential environmental programs. 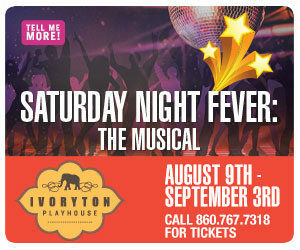 Enjoy a pre-show reception with hearty hors d’oeuvres and a cash bar on the tent-covered patio at the Ivoryton Playhousebeginning at 6 p.m. Then, get ready for the nostalgic songs of the Bee Gees that defined the disco generation! Can’t stay for the show? Join the Foundation for networking at the reception – a limited number of tickets are available for the reception only. Tickets are $60 for the reception and performance. There are a limited number of $20 tickets for the reception only available. Proceeds support environmental education programs and grants. To purchase tickets, visit www.rockallfoundation.org or call 860-347-0340.